1987 dated, US Army/Navy/Air Force, "Dress, Hospital Duty, Uniform"
This woman's 1 piece dress uniform is dated 1987. 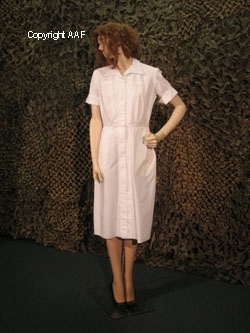 It is a multi-service, US Army/Navy/ and Air Force issued dress called: "Dress, Hospital Duty, Uniform, 65% Ployester, 35% Cotton." This uniform is in excellent condition with only a few tiny unobtrusive stains that should launder out. The size is a comtemporay period 12 Regular. 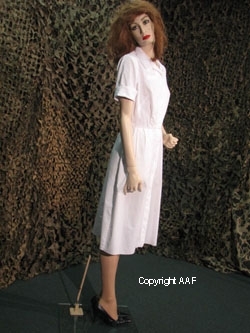 This 1987 dated dress is known to have been worn thru the 1991 "Operation Desert Storm" period. They were worn by all branches of the US military. They are standard issue for MASH, Hospital Ship and Station Hospital units. They were worn by both female nurses, doctors, and other medical branch personnel. 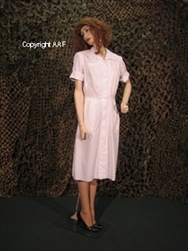 This is NOT the much more common and less valuable, similar looking, Kitchen Service personnel dresses which are usually fraduantly sold as if they are a medical personnel dress. Desert Storm period uniforms are quietly being bought up by speculatory dealers and collectors due to their current availability and future price excallation certainty. Soon the market with reflect in its pricing this supply and demand situation. This is a excellent and affordable dress. It conjurs up many fanciful images of our military nursing angle!